While I have been off work, I have been reading many books and watching a lot of Food Network and Cooking Channel. Many I have seen before, but some I have not. I love Ina. I want her house in the worst way. Especially that kitchen with two cook tops and two ovens, that big fridge and the walk-in pantry. Sigh. It is the stuff dreams are made of. Last week she made Easy Sticky Buns and my mouth fell open at how delish they looked. I had all the ingredients on hand, so I made them the next morning. I will write the recipe as she wrote; however, I didn't use raisins as I hate them, and the butter amount for the 'sticky' is too much-in my opinion. I did check out the recipe on Food Network since I was too busy vegging while watching to write it down. People who commented said it was too much butter, but I made it as written-too much butter. Next time I make them I will cut it down to maybe 8 tablespoons. Preheat oven to 400 degrees F. Place a standard 12-cup muffin tin on a sheet pan lined with parchment paper (very important). In the bowl of an electric mixer fitted with the paddle attachment, combine the 12 tablespoons of butter and the 1/3 cup of brown sugar. Place one rounded tablespoon of butter mixture in each of the 12 muffin cups. Distribute the pecans evenly among the 12 cups. Lightly flour a wooden board or stone surface. Unfold one sheet of puff pastry with the folds going left to right. Brush the whole sheet with half of the melted butter. Leaving a 1-inch border on the puff pastry, sprinkle each sheet with 1/3 cup of brown sugar, 1-1/2 teaspoons of cinnamon and 1/2 cup of the raisins. Starting with the end nearest you, roll up the dough snugly in a jelly roll fashion around the filling, ending with the seam side down. Trim the ends of the dough about 1/2 inch on each end to give it a clean edge. Cut dough in 6 equal pieces, about 1-1/2 inches wide each. Place rolls cut side down in prepared muffin tin. Repeat with second piece of puff pastry. Bake for 30 minutes or until golden brown and firm to the touch. Remove from oven and let cool 5 minutes only. Invert the rolls onto the parchment paper. Ease filling left in the pan onto the buns with a spoon and press slightly into roll. I cannot even aptly describe how wonderful these, especially hot out of the oven. They lasted 2 days here and warmed up nicely in the microwave. I might have to bake a batch on Saturday because my college baby will be home for the weekend-I'm only a little excited! Mmmm! 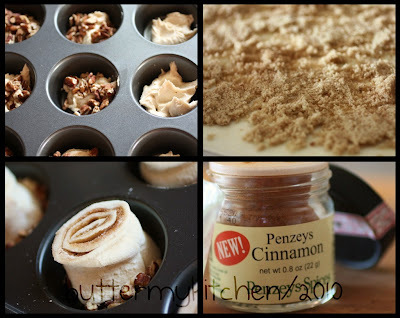 I love cinnamon rolls made with puff pastry! That looks like a whole lot of sticky goodness! I love Ina too. I'll have to try this with your adaptation of the butter.. like yourself, I abhor raisins!! Your photos are incredible! This looks to die for - I am going to try to make a #gf version. Uh, excuse me? Did you just say "too much butter"? No such thing my dear! ha ha! Ooh, i want her kitchen and garden!